‘The Engine’ is the archetypical box-to-box footballer who covers every blade of grass, seeks goal scoring chances, tracks down his opponent and displays relentless energy from the first minute to the final whistle. 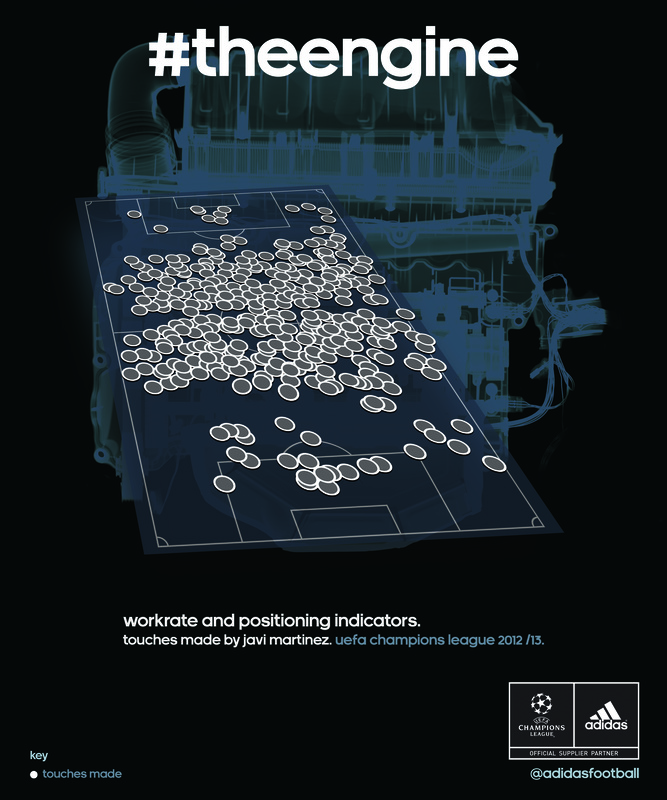 Based on the adidas insight, Opta have helped to reveal the fundamental character of ‘The Engine’ by finding out how to measure and quantify his performances. They have produced a mathematical algorithm which defines the perfect ‘Engine’ player and will be used to track this player’s performance from today onwards. Some of the players believed to fit ‘The Engine’ stereotype are Bayern Munich’s Javi Martinez, FC Barcelona’s Dani Alves, AS Roma’s Daniele De Rossi & Paris Saint Germain’s Ezequiel Lavezzi. With the help of Opta and their database of statistics and insights, the algorithm will be used to pinpoint ‘The Engine’ performances week in, week out. 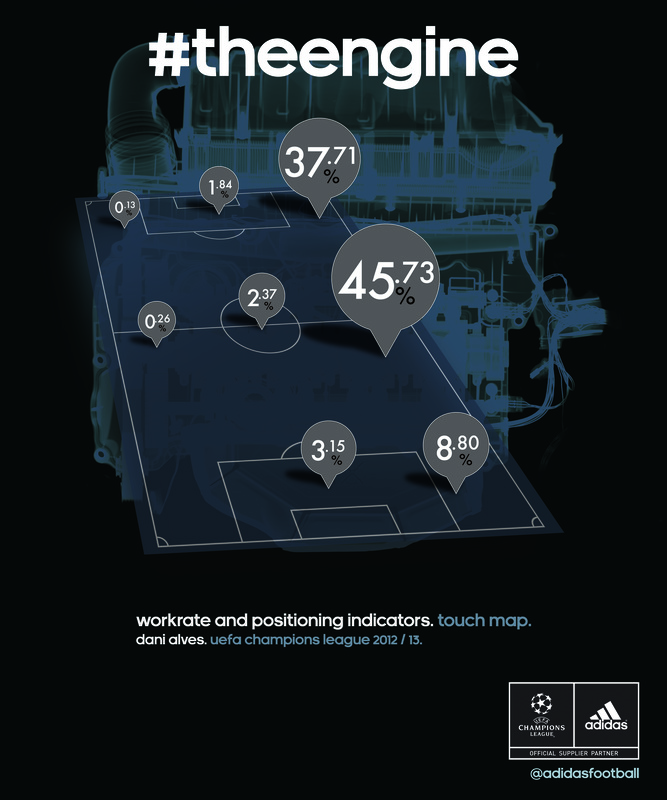 Certain indicators such as work rate, pitch coverage, and on / off ball statistics will be measured and players will be scored out of 100. adidas & Opta will analyse data from key matches from the UEFA Champions League and the Confederations Cup and highlight ‘The Engine’ players via an index entitled ‘The Engine Scale’ – results will be announced to media and fans through a series of info graphics and other statistic-based imagery as they become available on twitter @adidasfootball #TheEngine. Ahead of this week’s UEFA Champions League and UEFA Europa League Semi Finals, the algorithm has already focused on several of the world’s top players and has unearthed some stats proving how vital ‘The Engine’ has been during these campaigns. For example, Bayern Munich midfielder Javi Martinez is renowned for his committed style of play and has won on average 2.6 aerial duels per game in the UEFA Champions League this season, more than any other Bayern Munich player. Aidan Cooney, CEO, Opta commented: “We are delighted to be working with adidas on confirming the existence of ‘The Engine’ player. Modern football fans are passionate about comparing, contrasting and analysing their favourite players’ performances. By incorporating Opta’s uniquely detailed data, The Engine Scale can help to contribute to this debate before, during and after the match”. For further information please go to facebook.com/adidasfootball / optasports.com or @adidasfootball / @optasuit on twitter and join the conversation with#TheEngine. Posted on April 26, 2013, in News and tagged #theengine, 1.0, adidas, amp paris, Barcelona, bayern munich, dani alvez, daniele de rossi, energy return, energy sling, ezequiel lavezzi, javi martinez, NC, NitroCharging, opta, paris saint germain, soccer, sports, stats, the engine, touches, uefa champions league, work rate. Bookmark the permalink. Leave a comment.